Last transfer window was another madness, the clubs have spent fortunes to buy young players or stars. But there is also a parallel market which is a long-term market. Loaning players is a good solution for both clubs and players. Here we’ll see how loans can be a key in club and leagues strategies but also how it’s part of the “business-football”. If we look at a top level first, you see surprisingly that Serie A is an outlier: in average there are more than 20 players loaned out by a club in the first league in Italy when this number is around 5 in others leagues. Because FIGC – Federazione Italiana Giuoco Calcio – upped quotas, Italian clubs can now loan out more players. This system modification came in 2016 when Italian federation noted lack of Italians in Italian football. The fact is from Andrea Pirlo’s generation there are no more top Italian players in Serie A especially, and in other leagues too. Moreover, clubs can no longer deal with the co-ownership system which was often confusing and could block some transfers, like some cases in Portugal. Therefore these new rules giving team the opportunity to bring some of the talented players they have developed back into their squads rather than continually sending them around the country. Added to this new system, each club’s 25-man squad has to include four homegrown players and four more club-trained players who were also Italian-born. With the hope to raise Italian football, these new rules could be copied in England, where FA is looking to find solutions to improve homegrown talent, who are increasingly scarce. The other type of club are ones well known for their formation skills like FC Metz (Miralem Pjanic, Sadio Mane, Robert Pires, etc…) FC Valencia (David Silva, Juan Mata or David Villa), Schalke 04 or Lille. The big problem for these clubs is trying to keep their players despite offers which cannot be refused coming from top clubs. There is a third category of club which allied with of others clubs: Chelsea with Vitesse Arnhem, Manchester City with both Girona FC and New York City FC, Tottenham with Ajax Amsterdam, Sunderland with Feyenoord or trio Udinese, Watford and Granada in another way (the three belonging to the same investor group), etc… These partnerships facilitate players transaction but in some case, it blocks some young players to play at the top level like Lucas Piazon from Chelsea who was loaned several times in Vitesse Arnhem. Similarly, it may be subject to special things like the loan of Molla Wague to Leicester from Udinese, where he is already loaned from Granada. In La Liga average age for loaned players is 24 years old, which shows how it’s difficult to break through in this league for young players. In overall, the average age is 22 years old, showing that players maturity is always about 24 years old, despite recent trends suggesting that football is getting younger. In fact, it’s it is the entry of the professional game which is rejuvenated, but the age to reach the best level remains substantially the same. Loans remain a topic of debate: it’s difficult to say if a loan will be a benefit to players, depending on his age, his maturity and teams involved. Some leagues try to change some rules to strengthen themselves and making this subject an important point for national teams. 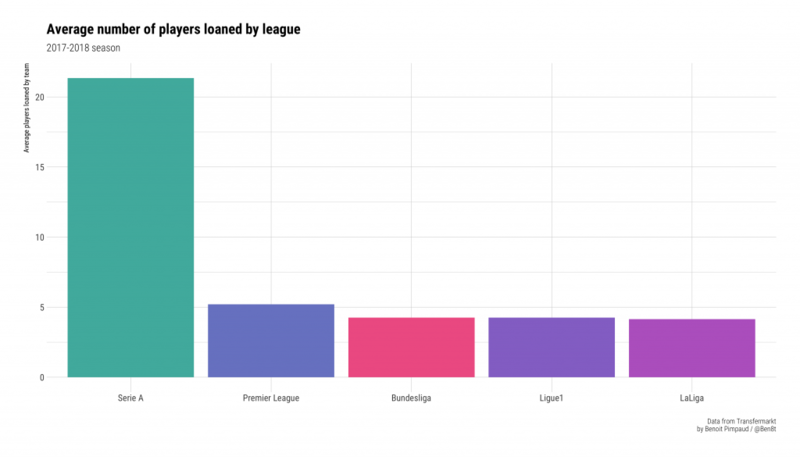 Moreover transfer madness these nowadays, loans are also a key for clubs to improve influence all around the world and their brand as real company. Nevertheless, it’s still a good system, allowing young players to reach the top level, injured players to recover or players who do not have enough playing time.